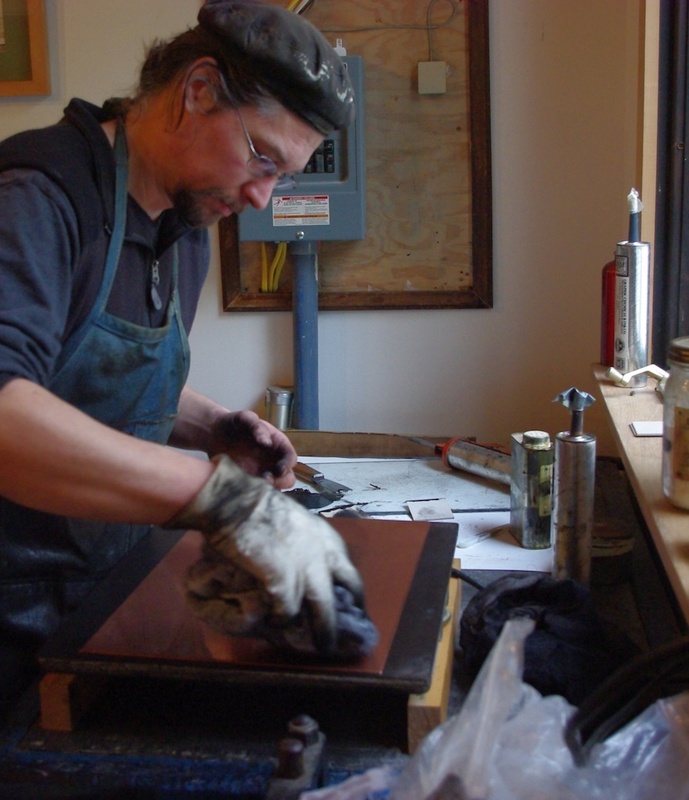 I am Chad Pastotnik, proprietor of Deep Wood Press which I established in 1992 when I purchased my little piece of paradise and built my first studio on the property. Nestled in the forest along the banks of the Cedar River in Northern Michigan’s Antrim County, Deep Wood Press has continued a centuries old tradition of hand-made books, bindings and other printed matter. With a foundation in fine art and a careful attention to craftsmanship and detail the end result is, hopefully, more than a vehicle for information. It is very important to me to maintain the traditional practices of printmaking, letterpress and book binding. The fine press world is somewhat moving away from analog composition but, admittedly, it is very difficult to set up a traditional print shop in the 21st century. Most of the type and specialized equipment is long gone so having put together a collection of very functional “vintage” equipment and desirable typefaces the best way to maintain it is to use it. My books are printed via letterpress on fine papers and are illustrated with art work from original wood engravings, lino cuts and intaglio prints created directly by the artist. The text is from metal type cast here on a Linotype composition castor or hand set from the type cases. These sheets are then bound by hand in traditional and contemporary book structures using fine leathers, book cloth and papers often with a slipcase or drop spine box to hold them. All this is done here in one place. Each aspect of a book conceived, created and finished in these two buildings. Maybe not fast but I find it quite satisfactory. Most of my inspiration comes from a deep admiration of what was done by fine printers from the 16th though early 20th century, a classical sensibility. Admittedly I have little taste for more “modern” styles, even shying away from sans types for the most part though having a healthy collection of type of that sort. I was fortunate to have been given a gift of a fellow printers library in the early 90’s. Though I never knew the man I came to know his friends quite well by their inscriptions to him in the books they gave him: Morris, Grabhorn, Rogers, Updike, Cleland, Dwiggins – these are the men I mostly learned my craft from and they led me back further to the printers past that they in turn held in awe. Since then I’ve been fortunate enough to examine Guttenberg bibles, Copernicus’s note-book, illuminated manuscripts from the hand of Irish monks and I know by all these things that I have oh so far to go. I’ll keep trying. University of Oxford, Oxford United Kingdom, “Sonnets 2016” Shakespeare’s sonnets in observance of the 400th anniversary of his death. 11/16 Also production of a “term card” for the Oxford Society of Bibliophiles. National Print Museum, Dublin, Ireland “Exquisite Editions, An International Exhibition of Finely Printed Books” International invitational exhibit of 25 fine press printers. University of Pennsylvania, Penn Libraries/Kislak Center, Philadelphia, PA “Color in American Fine & Private Press Books 1890-2015” The Jean-Francois Vilain & Roger S. Wieck Collection. PBS television feature – Chad will be featured in a new nationally shown PBS television series A Craftsman’s Legacy in episode 11 titled “The Bookmaker”. The show will begin airing in September 2014 and will also be distributed internationally. Attendance and participation at the Kerrytown Bookfest since inception in 2002. Guest speaker at the 2009-2014 events. As the daughter of a rare and out of print book dealer I seen my share of old books and rare items .He collected mostly Michigan history. I have some of his books made the old fashion way ,only wish he was still here to enjoy your great gift ,he would love your story and have many to tell himself! Umm, this is Chad, it’s my blog not Mike’s. I will pass your message along to him though. I am working on a book of etchings and just wondered if you recommend a good paper to use – I will be using chine collie on some of the pages so would prefer a paper weight between 180 -210 gsm. Arches, Rives, Somerset, Pretty much any of the usual suspects will be fine. My biggest concern might be page size and how it will drape or snap in the hand if you use an overly heavy weight of paper and if the paper has a grain direction you’ll want to plan your layout with that in mind. Hot or cold pressed sheet surfaces have an affect on the drape of the page also. I’ve had good intaglio printing results with Revere Book by Magnani in the 175gsm weight and it comes in both a white and buff color. Do you offer any letterpress classes or workshops? I live in traverse city and would love to learn the art of letterpress. I do offer private classes in the studio here. Feel free to contact me for an initial visit and we can talk about what you want to do. Wow, so very impressed with your work and interested in coming to see your studio sometime! I have a cabin in the east jordan area and love the area. Also love intaglio printmaking! I sent you a private email Kelly if it came through. Feel free to contact me for a studio visit next time you’re north.